Among the awesome things our modern world has to offer, inventive workouts are one of them. We’ve compiled a list of our top 5 favourites, from weightlessness to a water workout. These genius concepts make keeping fit feel more like a fun adventure challenge, stimulating both the mind, senses and fitness levels of all who participate. Where the mind goes, the body will follow. That’s the philosophy behind LesMills newest innovation. Much more than an exercise class, it’s an immersive sensory experience that pushes your fitness into a new dimension. Forget about how long you’ve been pedalling for and synchronise your movements to the music and CGI graphics that will envelope you, and the entire room. A specially built studio provides this intergalactic experience, which for a cycle class, is pretty trippy! 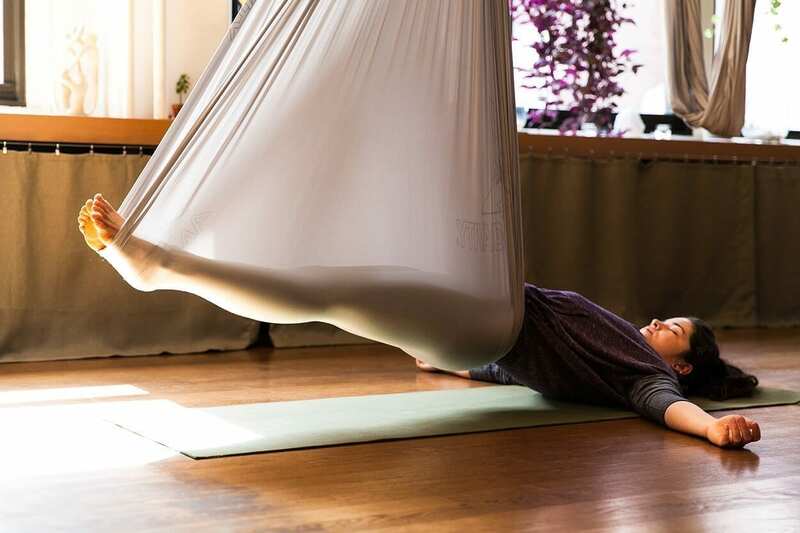 Where all the best in Yoga, Pilates and Aerial Fitness combine to create an elegant AntiGravity workout. The studio is nestled far above the noisy New York city in an expansive loft described as the perfect place for cultivating your inner zen. The founder of ANYA, Courtney Bauer, filtered through oceans of content to join together the best mindful techniques from across the ages into one total-body conditioning system, known as the ANYA method. Her goal was to create a fitness formula to strengthen the body, rest the mind and heal the soul. The result is a step by step guide for daily enlightenment as a highly adaptable and physical practice. What do you get when you combine a bouncy castle, trampolining, gymnastics, football, Brazilian dance, volleyball and latin music all into one competitive sport? Bossaball, duh. I had no idea this was a thing, nor that it had been around since the mid noughties! Though what really makes this an awesome sport is what it represents to people. It’s more than just an inventive workout, it’s a major tool for bringing the youth together in many latin communities, in a truly uplifting manner. An array of different flotation devices such as surfboards, paddle boards and “aquabases” can be used to practice this awesome core-strengthening atop-water workout. Some gyms like the Manhattan TMPL Gym offer surfboard yoga in pool classes, but you don’t need to join a gym to get in on the fun! All you need is a board and a body of water on a nice calm day. A one of a kind workout where you go full primal and get your body moving in ways it probably never has before. “Acting like an animal” has never been socially acceptable, but in this class it’s what it’s all about! Slither around like a snake, walk on all fours like a primate, and push yourself by activating muscles in ways we’re just not traditionally accustomed to as evolved humans. This is a great way to strip away conservative constraints and release bottled frustrations and anxieties. Let yourself loose in a professionally-led class. Here at The School of Natural Health Sciences we offer a selection of over 60 holistic therapy courses, amongst which is our diploma-correspondent Sports Psychology & Dynamics Course. Discover how psychology influences sports, athletic performance, exercise and physical activity. Aim to work with professional athletes and coaches to improve performance and increase motivation, or utilise exercise and sports to enhance people’s lives and well-being. This course is suitable for both sports people and those who wish to work as sports counsellors, providing an in-depth introduction to the theory behind mind power and sport. Incorporating many demonstrated and effective principles, including self-motivation, positive belief strategies, developing the ‘winner’ attitude, stress control and visualisation.